What do you call Nintendo 64 game Pokémon Snap with no Pokémon? Snap? "Originally, Pokémon Snap for the Nintendo 64 system wasn't a Pokémon game," recalls Nintendo president Satoru Iwata, "but rather a normal game in which you took photos, but the motivation for playing the game wasn't clear." With the Pocket Monsters got-to-collect-them-all craze in full effect in Japan, adding Pokémon seemed logical and fitting. 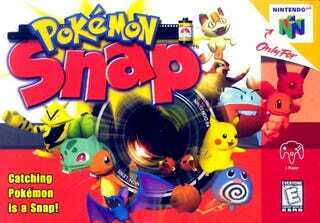 Game designer Masanobu Yamamoto was working on Pokémon Snap, and he initially had a negative reaction to the addition of Pokémon, because the characters replaced what he was working on. "That time, adopting the Pokémon world clarified what we should do and the direction we should head," Yamamoto adds, "and I came to like Pokémon, so I felt like that had saved us." Pokémon Snap was released in 1999 and went on to sell over 1.5 million copies.